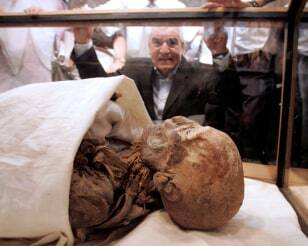 Mummy of Queen Hatshepsut found? Were Incan children fattened up and sacrificed? Oetzi the Iceman murder mystery solved? In "The Mummy: Tomb of the Dragon Emperor," Han, the Dragon Emperor, wakes from a 2,000-year-old curse and threatens to plunge the world into his unending, merciless service. Explorer Rick O'Connell and his family battle the resurrected mummy from the catacombs of ancient China into the frigid Himalayas. 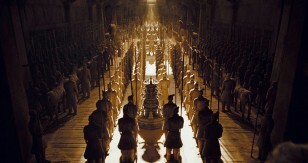 The movie is pure fiction, inspired by the famous terracotta army that guards the tomb of Emperor Qin Shi Huangdi. Real-life mummies have fascinated the public for decades — often with their own horrific tales. Click on the "Next" label to learn about eight of their stories. The mummy of King Tutankhamun, the 19-year-old pharaoh whose life and death have captivated audiences ever since his gilded tomb was discovered in 1922, went on public display for the first time in November 2007. He was placed in a climate-controlled box in Egypt's Valley of the Kings. 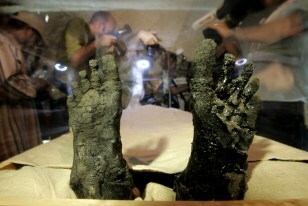 Tut's blackened, leathery face and feet, shown here, poke out from a linen covering. CT scans of his body in 2005 ruled out murder as the cause of his death in 1323 B.C. More likely, archaeologists said, was a broken left thigh bone that may have caused a fatal infection. 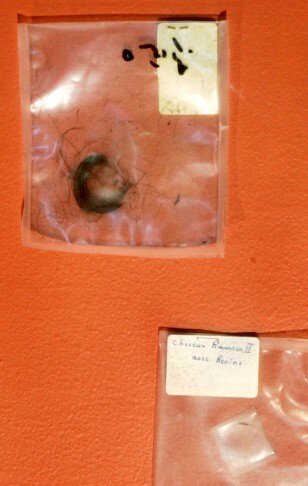 How much is the lock of hair in this photo from the ancient Egyptian pharaoh Ramses II worth? According to Frenchman Jean-Michel Diebolt, the answer is about $2,600. He put the locks, along with some linen bandages and resins used in the mummification of Ramses II, up for sale on the Internet. Diebolt's late father, a French researcher, had examined the mummy in 1976 and apparently kept the mementos. Egyptian antiquities officials retrieved the lost artifacts in April 2007. Ramses II ruled from 1270 to 1213 B.C. and is celebrated as one of Egypt's most powerful pharaohs. His legacy includes some of Egypt's grandest monuments, including the Ramesseum temple complex. Queen Hatshepsut ruled ancient Egypt for about 20 years as a female pharaoh after she stole the throne from her young stepson, Thutmose III. But after her death, in 1458 B.C., all trace of her name was obliterated from the records in what archaeologists believe was an act of revenge by her stepson. In June 2007, Egyptian authorities announced the mummy in this picture, unearthed a century ago, is the long-lost queen. The claim was based primarily on CT scans that showed, for example, a gap in her mouth matches a tooth in a jar with her insignia on it. In the arid coastal stretches of modern-day Chile and Peru, an ancient fisherfolk known as the Chinchorro took the mummification of their dead seriously and spared no one from the practice. They were the first culture known to purposely preserve their dead — the earliest examples date to around 5000 B.C. All members of society, from the elite to children and miscarried fetuses, were mummified. The technique changed over the years, but internal organs were commonly removed and replaced with vegetable fiber and hair. 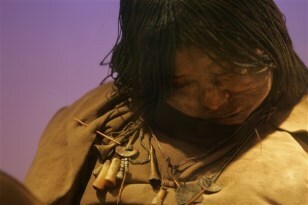 The 15-year-old girl known as "La Doncella," shown here in a photo from a museum in Salta, Argentina, along with a 6-year-old girl and a 7-year-old boy, were apparently "fattened up" before being sacrificed at the top of the Llullaillaco volcano on the border of Argentina and Chile, according a recent analysis of hair samples found with their mummified remains. In the months before their deaths, more than 500 years ago, their diet shifted from potato to corn and perhaps llama meat — an indication of elevated status. The mummies, called the Children of Llullaillaco, were dressed in fine clothes and given corn alcohol before they were left to die on the 22,080-foot volcano. Hailed by Time magazine as one of the top 10 scientific discoveries in 1995, Juanita, the Ice Maiden, remains one of the most spectacular mummies ever found. Anthropologist Johan Reinhard and climbing partner Miguel Zarate uncovered the 12- to 14-year-old girl from the crater of Mt. Ampato, a Peruvian volcano. She was apparently sacrificed by Inca priests to appease the gods sometime between 1440 and 1450. 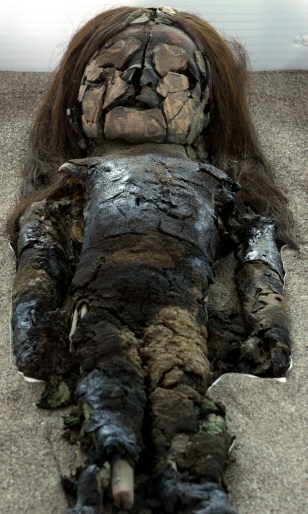 There she froze, her body preserved for 500 years. 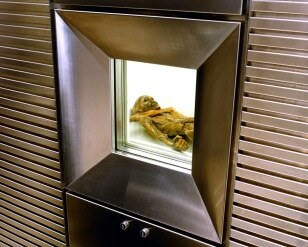 How did Oetzi the Iceman, seen in this photo from the South Tyrol Museum of Archaeology in Italy, die? According a story patched together from a pair of detailed examinations published in 2007, the 5,000-year-old mummy most likely took a fatal blow to the head after an arrow lacerated an artery below his left collarbone. Hikers in 1991 discovered Oetzi in the Italian Alps, face down with his left arm across his chest. Scientists believe he fell backwards, but was rolled over by his attacker who pulled out the arrow, leaving the arrowhead imbedded in Oetzi's shoulder. In August 1984, workers cutting peat at Lindow Moss bog in northwest England hit upon the well-preserved body of a man, about the age of 25, who died sometime between A.D. 20 and 90. 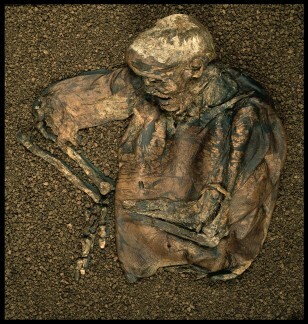 Lindow Man, as he became known, is Britain's best known bog body, one of several dead people kept remarkably intact due to the acidity, cold temperature and lack of oxygen in the bogs. Detailed studies of Lindow Man conducted at the British Museum suggest he died a horrific death. He shows evidence of two blows to the head and a third to the back. He was then strangled with a thin cord that snapped his neck, had his throat cut and was placed face down in the bog. Some scientists suspect this was a ritualistic killing.